Hashish, or hash, is a sticky, clay-like substance derived from the cannabis plant. It is produced by collecting, drying and compressing the fine resinous growths from the plant. It is formed into balls or bricks and then smoked or vaporized. The main ingredient in hash is delta-9-tetrahydrocannabinol, more commonly known as THC. Hash is more potent than marijuana because it contains a higher, more concentrated amount of THC. Ingestion or inhalation of THC causes the body to produce more dopamine and puts the user in a euphoric state, also known as a “high.” This is one of the main reasons why hash and other cannabis products are popular among recreational drug users. Entering a hash detox center for detoxification and treatment can help remove THC from a person’s system and help him or her stay sober. Some people believe that cannabis-based drugs like marijuana and hashish are medically beneficial, while others dismiss that notion and believe that they have no medicinal value whatsoever. 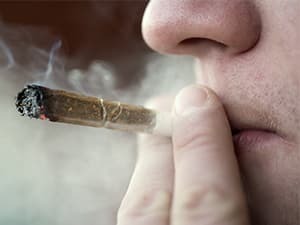 These two groups have been debating this issue for a long time, with the former advocating for the legalization of marijuana and the latter opposing this move. Whether or not hashish has a place in medicine, the truth is that this drug can be addictive. Hashish and marijuana addiction is most prevalent among teens, and it is usually a stepping stone toward using more potent and dangerous drugs. According to the NIDA’s Monitoring the Future survey, in 2010, 17.3 percent of 8th graders, 33.4 percent of 10th graders, and 43.8 percent of 12th graders had taken marijuana or hashish in their lifetimes. For more information about hashish and where to find a hash detox center near you, call us at 1-888-287-0471	Who Answers? to speak with our addiction advisors. The effects of long-term exposure to hashish smoke are similar to those of tobacco exposure. Since hash is usually used with tobacco, the risk of developing respiratory diseases increases. If you know someone who shows symptoms of hash addiction, call us at 1-888-287-0471	Who Answers? to learn the location of the nearest hash detox center in your area. Long-time hashish users may experience “burnout” or become mentally and physically sluggish and slow. “Even if hash addiction is of a psychological nature, long-term use of the drug can still cause some physical dependence and tolerance.”Even if hash addiction is of a psychological nature, long-term use of the drug can still cause some physical dependence and tolerance. In the past, it was believed that people who had been smoking hash for a long time did not suffer from withdrawal symptoms when they stopped using the drug. However, recent studies have shown that people who stop smoking hash after prolonged exposure to the drug do experience both physical and behavioral symptoms of withdrawal. Since THC stays in a person’s system for a long time, symptoms of hash withdrawal may be present for weeks or even longer, depending on the amount of THC in the system. Going through a detoxification program at a hash detox center can speed up the process and cleanse the body of THC faster than just going “cold turkey” at home on your own. Detoxing in a medical setting also decreases the likelihood of relapse during the withdrawal process. The physical manifestations of THC withdrawal include weight loss due to loss of appetite, tremors and chills, stomach problems, rising body temperature and disturbed sleeping patterns. Other symptoms of hash withdrawal include irritability and anxiety, constant craving for hash and other cannabis-based drugs, mood swings and other behavioral changes. Overdosing on hashish is not likely; however, constantly smoking large amounts of hash could lead to serious health problems. The first step to getting clean is to detoxify the body. A person going through hash withdrawal will have an easier detox experience than those who are addicted to harder, more potent drugs; however, it is still an uncomfortable experience. Relapses happen when discomfort overrides the person’s will to stay clean. Entering a hash detox center for detoxification and treatment can greatly help manage symptoms of withdrawal as well as speed up the detoxification process. Most drug rehabilitation and treatment facilities are equipped to deal with addiction to hash and other drugs with THC, and going through these programs can really help a person kick the habit for good. For more information on hash detox programs, feel free to call us at 1-888-287-0471	Who Answers? to speak with one of our compassionate addiction advisors.